The Laser Assisted New Attachment Procedure or LANAP was invented in 1994. This procedure is the minimally invasive laser surgical approach for the treatment of advanced gum disease. It was thought to be just as effective as traditional scalpel-and-suture surgical methods. Since then, advancements in the technique and improvements in laser technology have allowed dentists to target specific types of bacteria more safely and effectively. The LANAP procedure actually assists gum and bone tissue regeneration by eliminating bacteria and infected tissue. Most importantly, the procedure allows the body’s own stem cells to regrow tissue. With the precision and versatility of lasers, dentists can target the source of gum inflammation, tooth decay, and periodontal disease. All of this is done without hurting, cutting or removing any healthy tissue. The lasers can also slow down or even stop unhealthy gum tissues from changing shape or receding further from the teeth. This process allows the body to recover from chronic gum infection, without the need for hand-cut incisions or conventional sutures. The minimally invasive nature and ex­pendable surgical materials required make this procedure a constantly evolving approach. It is now effective as the best first line of management or even preventive treatment of periodontal disease. The specific laser settings are used to target the harmful bacteria, which is made visible by shining light through the contaminated area. As the laser beam penetrates the infected gum, the dentist uses a specific wavelength to target and destroy the dark colored bacterial complex. 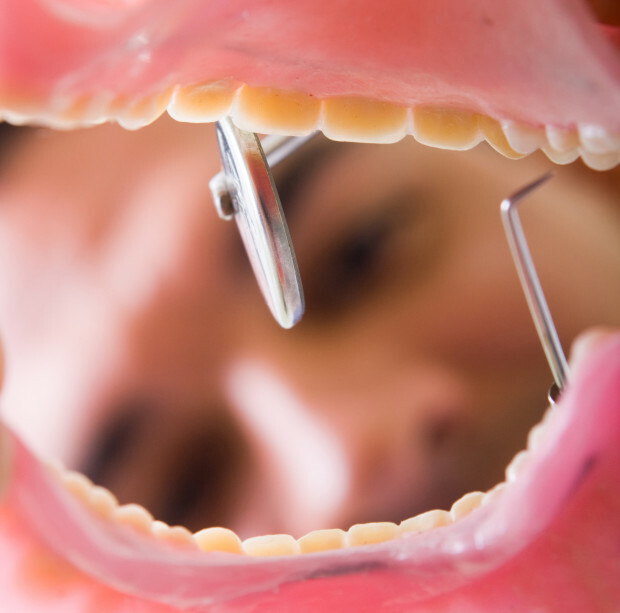 It specifically targets p. gingivalis bacteria – a contributor to gum disease. Tartar or calcified bacteria is then removed with an ultrasonic scaler that cleans the root surfaces. In the last step, the uses a specific setting on the laser. This setting creates a healing coagulum containing the stem cells from patient’s own bone marrow. Those stem cells are then added to the decontaminated pocket and seal the gum tissues against the tooth root, promoting tissue regeneration. The gelatinous seal protects the once-infected gums, allowing the body to begin the healing process. The best part of this process is that it foregoes the use of old-school stitches. Because of the prevalence of gum disease in adults and the damage it can cause to the teeth, gums, and bone structure, LANAP is often a patient’s best option for prevention and maintenance. The dentist can clean the teeth entirely with laser pocket tissue full decontamination or treat existing infection with regenerative treatment, preventing further damage. Recent studies also show that the suture-free sealing procedure can stimulate tissue regrowth while promoting more sustainable oral health. Here at Preserve Your Teeth®, we prefer to regenerate, restore, and rejuvenate patients’ gums and teeth, not cut them away. This is why we offer the only FDA cleared Laser gum treatment for true regeneration in office; The LANAP Protocol.